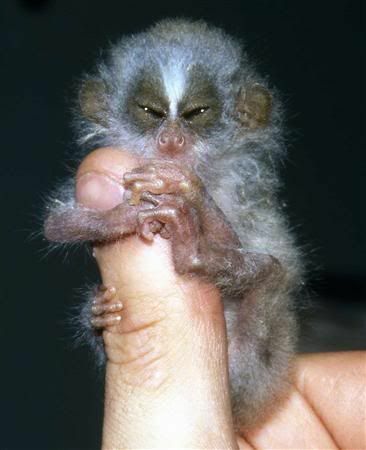 One more for the day, I'm not sure if you'll say "awww" or "uuhhh..."
A baby Slender Loris is seen in this undated handout image released by the Zoological Society of London on January 15, 2007. Scientists launched a bid on Tuesday to save some of the world's rarest and most neglected creatures from extinction. With an initial list of just 10, including a venomous shrew-like creature, an egg-laying mammal and the world's smallest bat, the programme will give last ditch conservation aid where to date there has been little or none. And um, notice the conservation effort here. Kudos to London Zoo (again...because they're also the people who prompted my hippo posts).